The Ahla Beach in Andros… and the wetland! The Achla beach is one of the most beautiful beaches in Greece and for a good reason since it is much more than a beach. In fact, it is also an unusually rich environment with impressive plantain trees. In Achla Beach flows the Achla river, one of the three most big rivers of Andros, whose streams run even in summer, making it a significant attraction. The stream of Achla springs from the slopes of the mountain of Vourkoti surrounded by rich life, entirely different from that which usually prevails in the Cyclades islands. Apart from the high plane trees, there are also small waterfalls that end up in little lakes offered for swimming! In this environment live freshwater crabs, eels, waterfowl, rabbits, partridges, rare migratory birds and colourful dragonflies. Should I go by land or by sea? 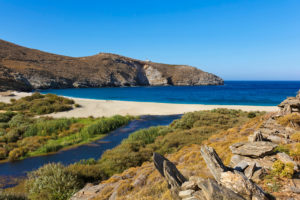 Achla beach lies northeast of the island, north of Chora, under the village of Vourkotis. It has beautiful, white pebbles and sand. Its waters are emerald and always quiet, even with strong wind. At one end of it is the small chapel of Agios Nikolaos and in the other the imposing lighthouse of Gria. Achla Beach in August fills with yachts and boats. However, it remains always beautiful and one of the most famous spectacles of the island. You can visit Achla Beach by the dirt road or the sea. Approaching it from the dirt road will have the chance to meet the new Monastery of St. Mamas. Approaching through the sea will have the opportunity to see caves and islets. 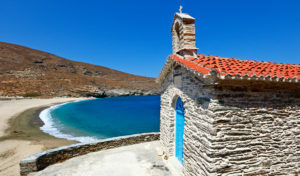 In fact, on the islet with the Virgin Mary’s chapel, in September will be seen the seabird “Mavropetritis”. It is a rare species of hawk that nests there to reproduce, just before it starts its journey to Madagascar, where it will overwinter.